“You’re not managing an interruption, you’re raising a human being.” I read this quote on another blog this week. I’m not even sure where I saw it. I’ve been reading about raising healthy kids and that having them help in the kitchen is one of the keys to healthy eating. In addition to farm visits, U-Pick and our CSA, helping in the kitchen is our next logical step. We’ve made peanut butter and occasionally, Nick and Sally will help dump ingredients in a bowl or push the button on the blender. But, they are starting to get old enough to do more. A couple of weeks ago, I had them start using the salad spinner. I rinse the greens and get it ready and Nick and Sally both take 3 or 4 turns of 5 pushes as the greens spin. It helps them learn to count and take turns in addition to helping me prepare the greens. It gives us an opportunity to talk about cleaning veggies and getting salad ready. Earlier in the week, they added all of the ingredients for our blueberry banana smoothies to the blender. It was a slow process as the blueberries went in 3 or 4 at a time, but they were making the smoothies and loving it. 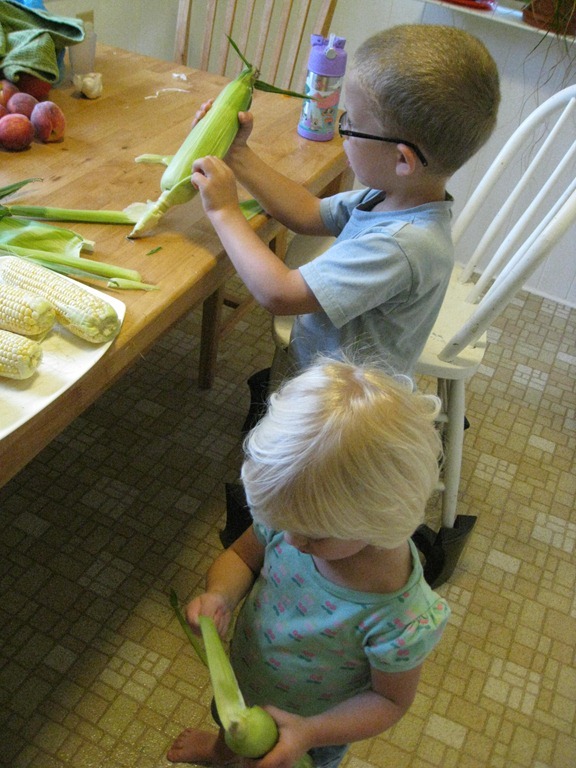 Yesterday, we received sweet corn on the cob in our CSA. CSA day always makes dinner time a bit hectic since we usually get home about the same time I should be making dinner. With fresh corn, I thought we should definitely enjoy it along with the roast that I had cooking in the crockpot. As I began to clean the corn, Nick came in the kitchen and wanted to help. I felt interrupted and really wanted him to go back into the living room and leave me alone so I could finish dinner. Then, I began thinking about the quote and my desire to have them learn about healthy cooking. So, I looked around and tried to think of something they could do without the hot stove or a knife. At this point, Sally had joined Nick. She doesn’t like to be left out. 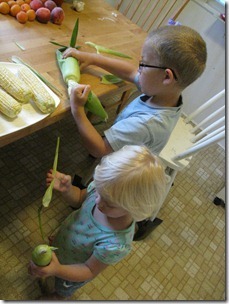 Then, I thought – maybe they could shuck the corn!? We’ll try it. Intense concentration ensued. We talked about taking the outer greens off first and getting all of the strings off so we could cook it. Even Sally could do it. I will say that it took FOREVER, but it was totally worth it. 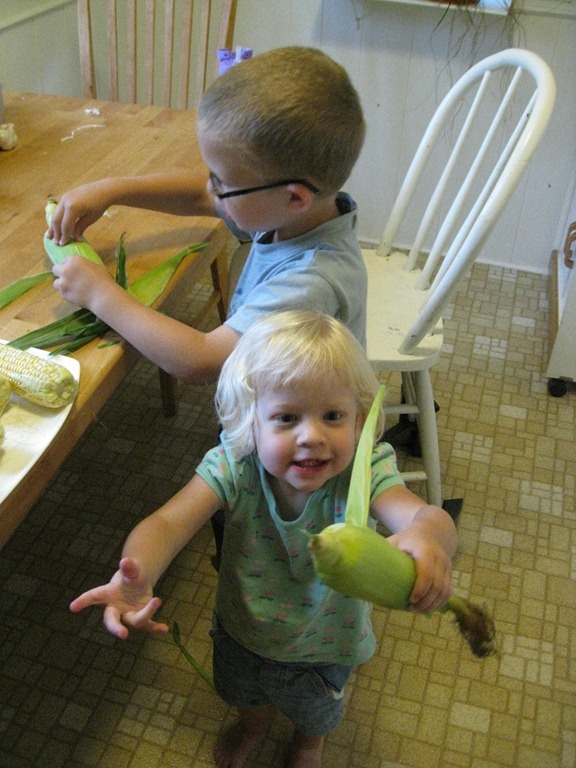 Both of them were so proud of the corn as we ate it for dinner.